PHD (output tray) - a printer output tray, located on the side of the printer paper outlet, includes a substrate and relevant inclined substrate supports which tilt to the paper exit direction, while a free end of the support adjacent to the printer is paper outlet. 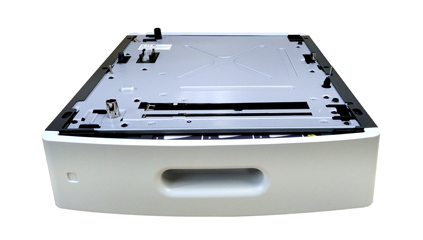 PHD (output tray) - a printer output tray, located on the side of the printer paper outlet of the printer output tray includes a substrate and the substrate is inclined relative to the support member, the support member relative to the paper exit tilt direction of the paper, a free end of the support member adjacent the printer is paper outlet. The printer output tray and the paper includes a support member inclined direction, the front end of the printed paper will be exposed in a direction parallel or lesser angle to reduce the occurrence of the roll paper support.